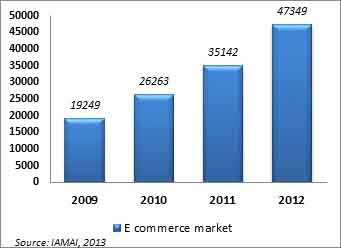 Scope and Growth of E commerce - a 2013 Update | Business Article | MBA Skool-Study.Learn.Share. 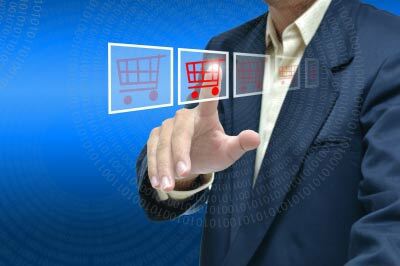 The ecommerce industry of India is one of the fastest growing segment in the Asia Pacific region. With a staggering CAGR of 34.58% from 2009 to 2012, the Industry has expanded from INR 19249 Crore (USD 3.49 bn) to INR 47,349 Crore (USD 8.60 bn) in a matter of 3 years. This expansion can be mainly attributed to the decrease in the price of personal computers, growth in the number of active internet users and the extremely competitive Internet Service Provider (ISP) market. 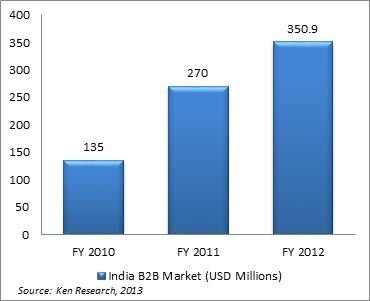 The Business to Business (B2B) grew from USD 135 Mn to approximately 351 Mn from FY 2010 to 2012 (Ken Research). In the B2B sphere, medium enterprises have the highest contribution at 48% followed by 32% and 20% of small and micro companies. Lack of awareness among the micro enterprises regarding internet technology has hampered growth. However things look promising as small enterprises has displayed the highest CAGR of 69% in the last 3 years. This is mainly because a majority of these firms are run by young entrepreneurs who have higher propensity to use internet as a platform for generating sales. Players like indiamart.com, Tradeindia.com and Alibaba.com have hogged a majority of the market share. With a 3-firm concentration ratio of .957, the B2B market is high concentrated. In the Business to Consumer (B2C) domain, the primary driver of growth is high internet penetration and increase in the number of active users. The rise of the disposable income of the middle class India has led to an increase in online spending of the goods. According to Internet and Mobile Association of India (IAMAI), as many as 19.2 million people have looked for information online, Out of these, 73% have bought either some goods or services from the internet. The number of people who shops online has doubled in mere two years and is a positive sign for the ecommerce industry. Owing to the small size of the B2B market, this article limits itself to the scope and growth of ecommerce in the B2C sphere. There is high internet penetration in tier 1 cities and the number of online shoppers is rising. There is also a rise in the disposable income of customers. Possibility of price war among e commerce companies has led to reduction in profitability. There is a lack of proper distribution channels particularly in tier 2 and tier 3 cities. This is going to reduce the level of customer satisfaction. The element of “fun” in the shopping experience is missing in case of online shopping. There are worries in the minds of customers about the personal security and that the financial details entered while shopping online will be misused. In some cases, there is also lack of trust amongst customers about the quality of the product. The industry can be segmented into mainly travel and non travel sites. Online travel comprises 71% of the Digital Commerce pie. This is because of the booming urban internet savvy population who prefer to book rail and air tickets online. The other segments mainly E-Tailing, Financial Services, Classifieds, and other online services constitutes much lesser share of the digital space. The online travel segment has seen a CAGR of 55.5% from 2007-2012. The is due to rise of disposable income, surge in demand for domestic travel and the boom of the tourism industry. Domestic travel contributed to as much as 50% of the total market, followed by railways tickets, international air tickets, hotel bookings and bus tickets. The Indian online travel market is highly fragmented. Indian Railways, the market leader, has only 19.2% reach. Other major players like makemytrip.com and yatra Online has 11.6% and 8.3% respectively. The portals have transformed from a mere ticketing website to a complete travel guide. To reduce the dependence on air booking, these portals have introduced deals and package tours. The online travel segment market is expected to grow at a CAGR of 32% for the next 5 years and will remain a dominant contributor to the total e-commerce revenue. E-tailing encompasses buying consumer items like apparels, electronic devices, home and kitchen appliances, jewellery, online. The E-tailing market grew at a staggering pace of 60% in the last 3 years.This high growth is due to changing customer preferences, faith in online retail, and high convenience yield provided by online shopping. Competition is intense due to low entry barrier of this segment. However, Amazon.com, flipkart, snapdeal.com,jabong.com, and myntra.com are some of the major players. This segment is expected to grow further as people become more pressed for time. Also the choice that e-tailing sites offer to customers will drive demand for this segment. However there will be intense price based competition in this sector and consolidations are in the order. The financial services segment includes applying for insurance, paying online bills, and premiums and online transactions for financial services. According to Ken research group, in every 18 minutes an online insurance plan is sold. The costs of these insurance policies are lesser with premiums being 40%-60% cheaper. This is a win-win situation for both the insurance provider and the customers. Also the convenience provided by online portals has led to more customers choosing the online route for bill payment. The online financial services segment is expected to grow at the strady pace of 23% for the next 5 years. The growth will be fuelled by the expanding online insurance market and more internet penetration. In addition to that, many Indian banks have rolled out online loan application process. The classified segment has also witnessed some 40% growth over the last few years. It is in a very nascent stage and has lot of scope for growth. Online advertising is lot cheaper than conventional methods and unlike the latter, it is not constrained to a geographic location. The growth is mainly fuelled by services like online job (60% of the segment), online matrimony, B2C classifieds and B2B classifieds. Naukri.com, timesjob.com, monster.com are the major players in the job market while jeevansathi.com, shaadi.com are the major matrimonial sites. These include sites offering online services like buying entertainment tickets, food and grocery. IAMAI estimates the market size of these services to be around INR 1,110 Crore in 2012. This is expected to grow by 25%. The market for buying entertainment, movies and sports tickets are valued at INR 795 Crore while online food delivery is sized at INR 250 Crore. Bookmyshow.com is a major player in the segment. The growth of e commerce will be on two accounts: One is due to the changes in the macro-economic parameters like disposable income, internet penetration, inflow of investments, and the other due to segment specific factors. According to the International Monetary Fund (IMF), personal disposable income has grown by 15.8% annually from 2007 to 2012 reaching to USD 1546 billion in 2012. As personal disposable income rise, it signals that the purchasing power of the people and their standard of living has increased. As a result, demand for goods and services are expected to rise. With more disposable income, the benefits of time saving offered by e-commerce will lead to growth in the sector. Internet penetration has increased by a CAGR of 30% from 2007 to 2012. There has been an increase in internet user base and such trend is expected to continue. With more number of unique users, the attractiveness of the sector will rise. This will led to more advertisement on the digital media. As advertisements increase, the trial rate and the repeat rate for online retailing is likely to increase. This will trigger growth in both the travel and non travel segment due to more customer acquisition. The demand for debit and credit cards has also seen a steady rise over the last few years. Most of the banks now provide online banking and debit card facility with every new account. With the financial inclusion drive by the RBI, the number of bank accounts (and hence the number of debit cards) will definitely see a rise. This coupled with rising disposable income will invariably lead to more online transactions. In the online travel segment, growth of the tourism industry and demand of domestic travel will have positive externalities on the e-commerce industry. With travel websites providing additional features like hotel booking and package tours, the convenience factor offered byy these websites will lead to growth. Additionally, internet gives users the a choice where they can evaluate an offer, compare the prices and decide on the one that suit their demand. In the online retail space, absence of showrooms and high cost of transportation prevents those in tier 2 cities to access global brands thus increasing demand for online shopping. The ecommerce industry in India is nascent. With internet penetration, Personal disposable income on the rise and with gradual demand of debit and credit cards, the ecommerce industry is all set for some good growth numbers in the future. There are, however, concerns amongst customers regarding the quality of the product/offer, lack of the “fun” factor of shopping, and, about the security of the online payments. These challenges are being addressed by innovations like cash on delivery, money back guarantee, such challenges can be easily dealt with. Due to lower barriers of entry, competition is likely to be quite high. Price based competition can lead to shrink in margins. However the next few years will see some consolidation in the market space and inflow of investment in this sector is quite likely. Overall the future of the ecommerce industry is indeed very bright. The article has been authored by Pritam Banerjee, IIM Ahmedabad.